Having vast industrial knowledge of the domain, we are offering a quality assured assortment of Electronic Safe. 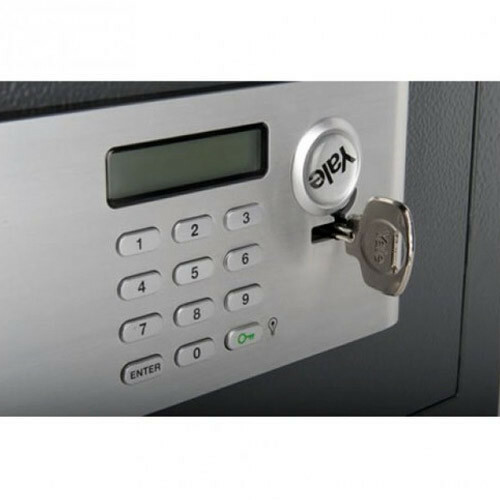 The Electronic Safe we offer is widely demanded amongst the clients for its sturdiness and safe use. These products are available in the market at reasonable rates. Established in 1960, Fancy Frame Glass Stores has been thriving on consist quality and reliability in the market manufacturing, and trading an extensive range of superior quality Glass Products and Fittings. The vast and extensive glass solutions we offer our clients include premium finished Glass Fittings, Glass Work and Decorative Stained Glass among other innovative products. These products feature outstanding, finish, performance, smooth texture, attractive finish and fine decorative designs. All these products provided by us are manufactured from high quality industry approved products and are of prime quality. The material used are reliable and durable as assured by reputed vendors in the industry. It is not only the premium material but also the skills and expertise of our qualified team of professional that delivers our product their appreciate features. This team is selected from the finest talent in the industry and is duly trained in the use of modern technology and equipment. We provide Glass Work Service. Mr. Adnan Moosa started the company with an aim to offer quality products to the customers and has kept up-to that ever since the establishment of the company. He understands the market and efficiently guides and leads the team as a mentor to our professionals enabling to develop innovative products that are of refined quality and high standards.